The pose of the week is Ustrasana. Ustra means a camel. Asana means pose or posture. Last week we focused on Parighasana - gate latch or gate lock pose. The kneeling aspect of Parighasana can be seen and experienced in Ustrasana. Ustrasana is a backbend. Backbends can be intense and confronting. They can also be exhilarating. One of the major challenges in Ustrasana is the head and neck position. 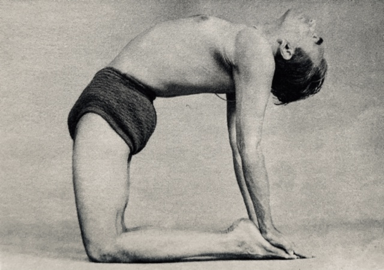 The directions given by BKS Iyengar in Light on Yoga is to ‘throw your head back’! I’m not so sure my head likes to be thrown! If you look closely at the photo of BKS Iyengar yes his head is back, but there is an effortlessness in it. His throat is relaxed and so his face. He’s in an ‘all-day pose’. The head is heavy. The average adult head weighs approx 5 kgs, but when it is back (or forward) the load is greater. 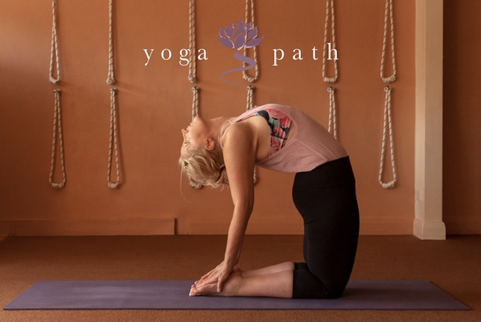 The strength in the neck is developed over time in yoga asana practice. 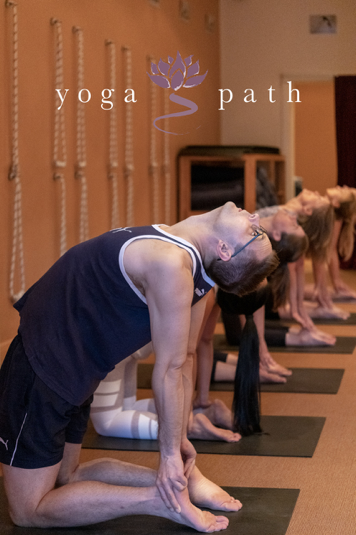 Think about the position of your head in the standing poses you repeat in the Beginner’s classes, such as Trikonasana (Triangle pose) where you have turn your head to look up and in Virabhadrasana 1 (Warrior pose 1) when you take your head back. So it takes time and practice. When I was sitting for my second assessment* I was required to do Ustrasana for 45 seconds. I found this physically and mentally extremely challenging. Even though 45 seconds doesn’t sound like a very long time. The weight of my head and my neck in that position would prevent me from breathing effectively. My lack of a decent breath caused me to set up a sort of flight or fight reaction (sympathetic nervous system). Over a period of months I set my sights on developing a smooth, steady, even breath and I watched and studied how peaceful I became in the position. It took time and practice. I discovered from my own experience how much my breath affected my mind, and my mind affected my breath. *Certified Iyengar teachers are encouraged to continually develop their teaching and practice skills. We sit assessments progressing through levels and are assessed by a panel of senior teachers. This requires the teacher to present their practice and teach on a particular weekend during the year and we are judged and critiqued on our abilities. Learn more about how the breath affects the mind: Pranayama/Restorative Class tomorrow Sunday 31st March 1pm-3pm.